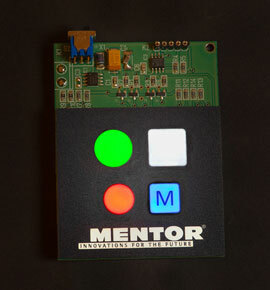 These clever illuminated switch examples are standard MENTOR products and are available in a number of variations. They share the common feature of providing an innovative and cost-effective solution for illuminated switch applications. 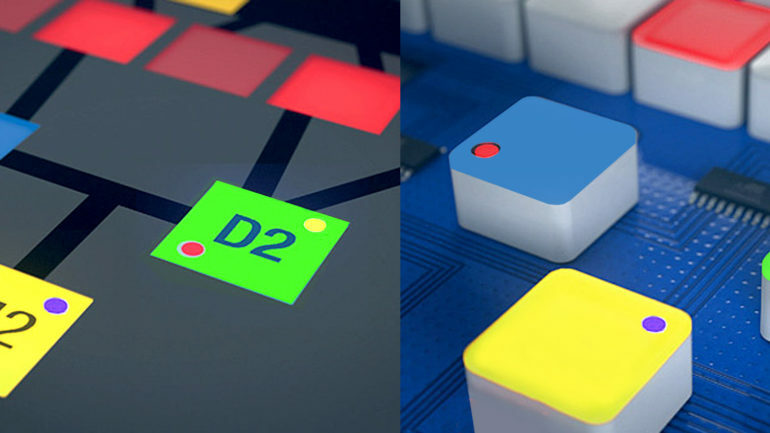 Given that you are unlikely to ever search for “illuminated switch caps”, please let us brief you on how you can exploit the concept! Since the LEDs necessary to illuminate the switch cap are only at top-right and bottom-left of the switch, MENTOR offer variants that incorporate light guides reaching-down to LEDs at the top-left and bottom-right of the switch. These can show LEDs of different colours that signal different functions. The basic principle is to place an SMD tact or dome switch on the PCB and then to locate two SMD LEDs immediately adjacent. A square plastic switch cap is pushed on as a final production process, creating the illuminated switch. These two-part plastic caps are special in that their faces are proper light guides, providing totally homogeneous illumination. MENTOR illuminated switch caps are available in standard 15mm and 19mm square versions with deeper variants for use with tact switches and very shallow versions for use with dome switches. Custom sizes and shapes, eg circular, are easily achievable. As standard, there are options for use under overlays as well as a range with “retaining shoulders” that can project through an enclosure aperture. Text foils can be inserted between the switch cap and a transparent secondary cap. The exploded view on the right shows the caps removed at top right and bottom left for illustrative purposes. Round and custom-shaped switches can easily be achieved via overlay printing and embossing. The switchcaps are contour-moulded to reflect the shape of the dome switch, thus providing mechanical protection from excessively-strong activation assisting with the switch’s longevity. 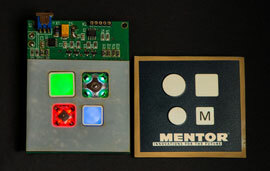 Another innovative, cost-effective solution from MENTOR!